You want the students to find your subject interesting. You want the students to investigate your subject in their own time, like an adult would do. You want the students to continue to develop their presentation skills. You want the students to pique the interest of the other students in the class in your subject. You want to expose the students in your class to a diverse set of ideas, opinions, and experiences. When I (briefly) attended Twitter Math Camp last year, I really enjoyed the My Favorite section of the conference. This is a section where teachers came forward and presented something that they liked that they thought the other teachers would be interested in. These included activities, strategies, etc. Pretty much whatever the presenter thought the other teachers would enjoy. They had about 5-10 minutes to present. 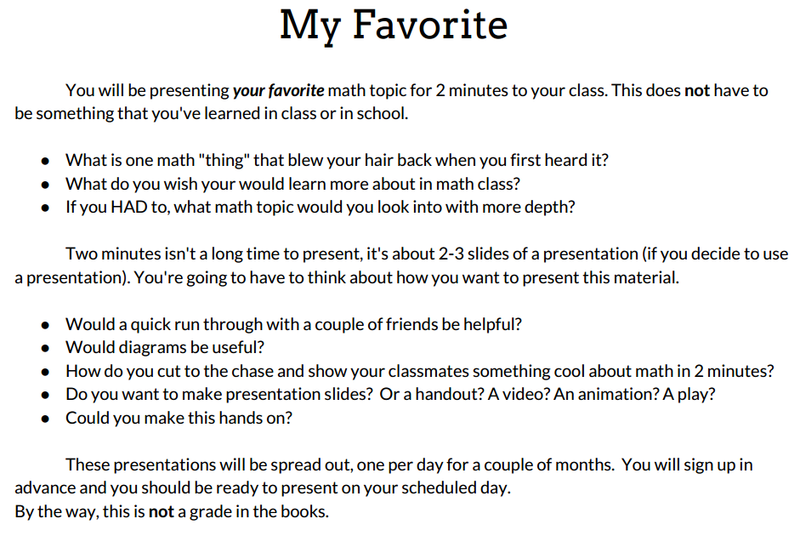 To co-opt this My Favorite structure to my classroom, I asked every student in all of my classes to present one thing that they found interesting about math. What’s faster, going up or going down? Only recognize about 2/3rds of them? Me too. It was awesome seeing the different mathematics that was discussed in our classes. What was the percent of topics that lined up with any of the final exams? I’d say under 5%. Do you have 2-5 min to spare 30 or so times per class per year with very little burden of prep on the teacher? I would bet that you do. Awesome! I’m so glad I read this because I was envisioning doing the exact same thing with my classes this year. I love hearing of your success! As someone who blogs on brain science and math for a site that was all about fact automaticity before I got there, I can just say “WOW.” I would love to get this exercise in front of some urban fourth-graders before they decide they don’t like math! Thanks Ron. I would love to see this with 4th graders! Dan– Great stuff. I love the idea of having this as a rolling class starter. I took the idea and modified it for my Digital Media class (http://jeff.thetillinghasts.com/?p=410)– we’re going to bang them all out in the first couple of days for this round, but I may come back to the long-running concept.